A glaring omission (with a capital G) was one EJ Sarmento. Sarmento helms Wyred4Sound whose mINT and mAMP monos highlight just how good ICEPowered amplification can sound in the right hands. 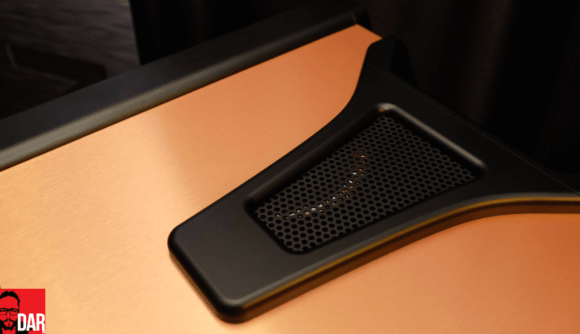 To these ears, the mAMP two-fer holds pole position among contenders for best amplification under US$2k for the KEF LS50. And that’s beating out some fairly stiff competition, one of whom contracts Sarmento for OEM work. Wyred4Sound’s ST and SX series power amps satisfy those more beefier budgets but don’t think for one momento that Sarmento is just ‘an amplifier guy’ (not that there’s anything wrong with that). 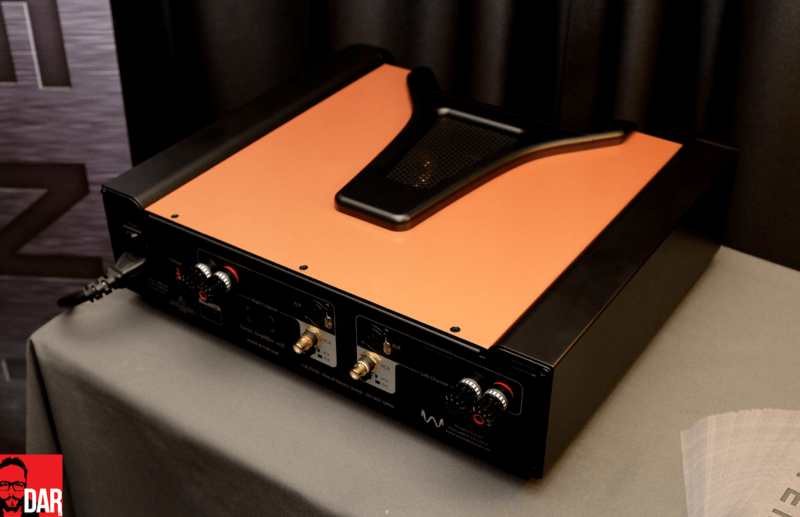 Showing the breadth of Sarmento’s design ability, Wyred4Sound offer a Linux-based music server, handheld USB converter and headphone amplifier as well as entry-level and higher end options in the pre-amplifier and DACs space. This commentator’s pick of the Wyred4Sound crop though is a rarer species: the Remedy S/PDIF reclocker breathes fresh life into the lungs of digital sources that sound comparatively short of breath in stock form: Sonos Connect, Squeezebox Touch, Apple TV, Apple Airport Express, gaming consoles, TVs, consumer-grade disc spinners etc. More recently, through his acquisition and reboot of Spread Spectrum Technologies, Sarmento diversified into Class A/B territory. 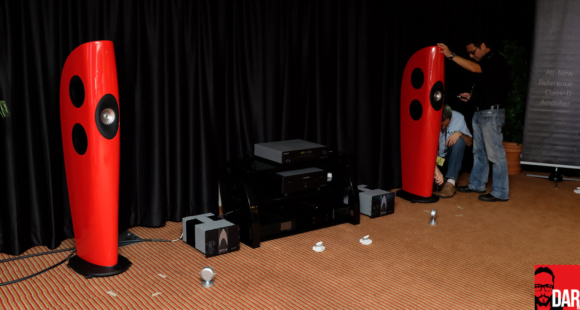 James Bongiorgio’s Son of Ampzilla II, resuscitated by a transistor-doubling third generation circuit (US$3500), left 6mooner Srajan Ebaen deeply impressed with its performance, especially when compared to the far costlier Pass Labs XA30.8. All up, that’s quite the resume for someone so young. EJ Sarmento has only just turned 30! Three. Zero. Does that not make you want to scream, “What the bloody hell have I done with my life?” into your pillow every night? At this year’s RMAF in Denver, Sarmento’s message was clear: he’s just getting warmed up. Young Sarmento is a fan of funky names that bring keyboard shortcut-induced grimaces to the faces of those reporting on his wares. The Californian chuckles when I mention his μDAC and μLINK: “It’s not YOU-DAC and YOU-LINK but microDAC and microLINK”. The Greek letter u [pronounced ‘Mu’] gets ’em every time,” he chortles. 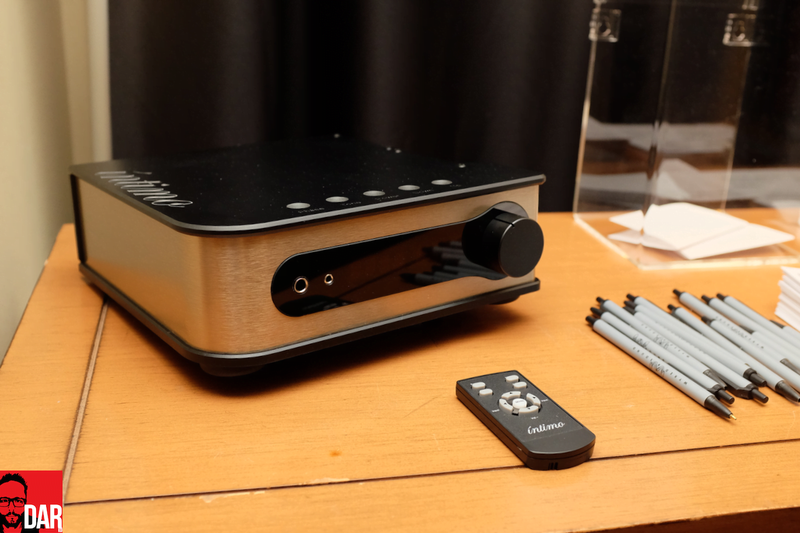 In which case, those same keyboards are set for further three-fingered shortcut workouts with the first of Wyred4Sound’s RMAF 2015 introductions: the Íntimo DAC and headphone amplifier. The accented leading letter points to the Italian word for intimate. Headphones, by their very nature, already take us closer to the music than loudspeakers. Íntimo’s intent is to nudge us closer still. Íntimo is a desktop-sized unit that’ll push up to 2.5watts into headphones connected to either of its front panel sockets. On the inside, an ESS 9018K2M chip running in current mode pushes its output into fully-discrete head-amp and line stages, the latter ensuring the Íntimo will also serve as passive pre-amplifier. More unusual for this kind of product in this kind of price range, volume attenuation takes place in the analogue domain. 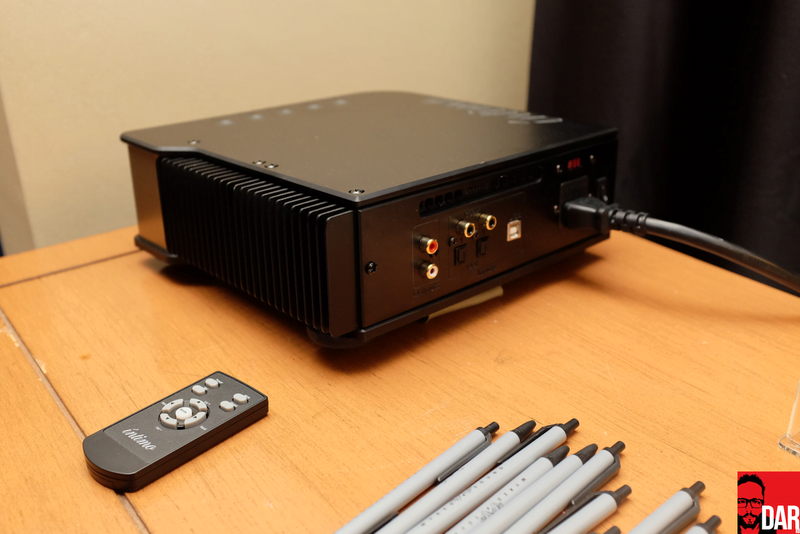 Digital inputs number five: USB, 2 x coaxial, 2 x toslink. Both 3.5mm and 6.4mm are specified on the front panel of the US$995 standard version whilst a balanced outputting edition will come with double the circuitry and a bonus analogue input. Pricing on the latter is expected to drop in below the US$2K marker. Sarmento invites me to “Feel the volume knob’s super smooth turning action”. It’s smooth alright, even if Sarmento’s Dad-joking delivery isn’t. Additional points of difference: a +-9db tone controls for low, mid and high frequencies, each with adjustable ‘turnover point’ and Q-slope adjustment; low, medium and high gain settings; phase toggle; balance control. Really separating Íntimo from the pack is a three point output impedance: 1 Ohm, 11 Ohms and 61 Ohms. 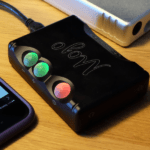 This will make it easier for users of IEMs – that typically have a low input impedance – and full size monsters – that can arrive with a high input impedance – to get closer to a more ideal input-output impedance ratio. Clever, Trevor. Finally for the Íntimo, Sarmento points to the large-finned heatsinks that run along the unit’s side. Intimo runs in pure Class A so it’s gonna need ’em. On the final evening of last year’s Denver event, Sarmento and Wyred4Sound marketing mainman Tony Holt took me out to dinner. Full disclosure: they paid. They wanted my take on their room and suggestions on how they might could step things up a gear (via association?) 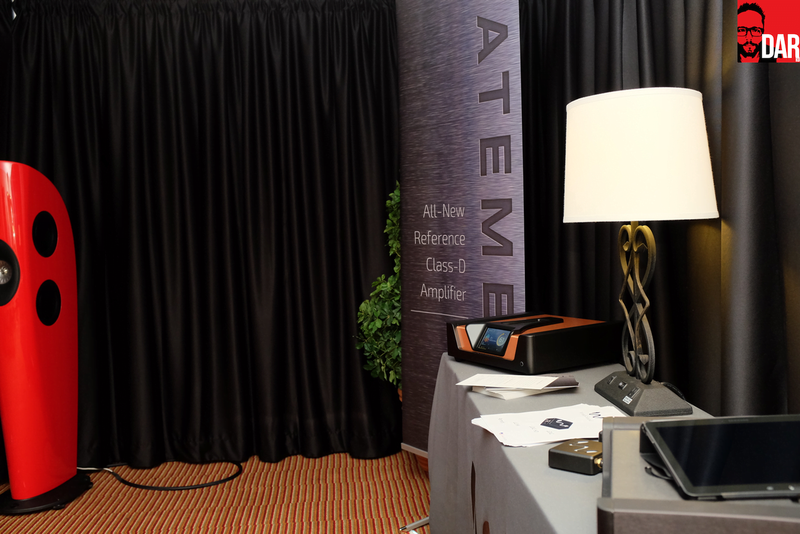 now that they had worked their way up RMAF’s exhibitor pecking order and into a larger demo room. My suggestion was two fold: 1) show with a loudspeaker that’ll have attendees clamouring for a look-see and 2) get a barista to make and serve coffee. On the latter, Sarmento was full steam ahead until baulking at the eleventh hour. “Too noisy,” he reckoned. 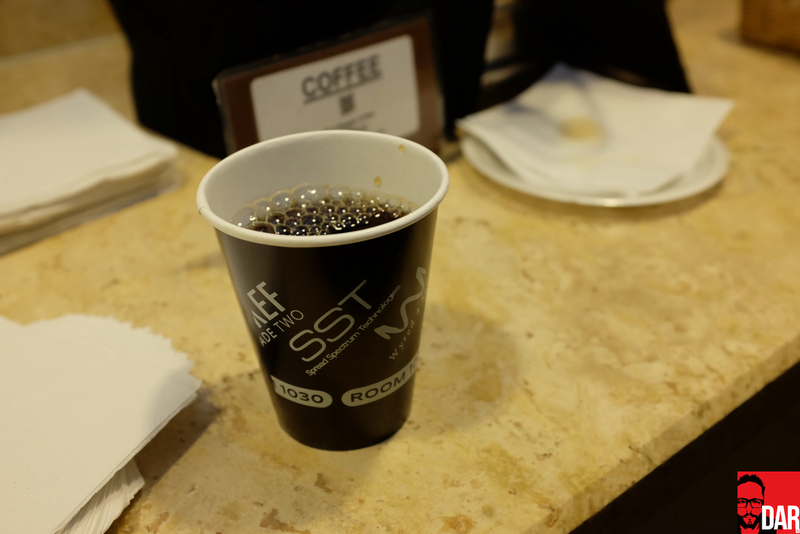 Instead, truckers coffee served in fully-branded cups would have to suffice. Fair enough I guess…but it’s a long way from Wyred4Sound’s 10th floor Copper Mountain suite to the Marriott’s Starbucks down in the lobby. Even longer for those battling ground floor elevator queues on their way back up the tower. For an eye-popping loudspeaker I’d suggested a pair of KEF’s Blade Two in candy apple red. An email introduction to KEF America’s New Jersey HQ was made by yours truly before leaving them to it. Chiming appropriately with Sarmento’s fresh faced outlook are the KEF engineering team who brought the Blade Two to life: young fellas, the eldest being 33! Would KEF see what others see: Sarmento as one of the (if not THE) audio engineer of his generation? (They would but not until a chance encounter between Wyred4Sound and KEF occured at Captial Audio Fest some months later). Lending substance to such a bold statement we look across the length of Wyred4Sound’s RMAF demo room, past the red Blade Two that landed according to plan and on schedule, to the far wall for news of an alternative deployment of the S-word: an all-new Statement Series that (at this pre-production stage) comprises only power amplifier and pre-amplifier. Through the top grille of the power amplifier we spy its enormous 1000VA power transformer that threatens a terra-firma-troubling 250wpc into 8 Ohms, 500wpc into 4 Ohms but, when bridge into mono, a San Andreas-faulting 1300wpc. Loudspeaker drive comes not from off-the-shelf Class D modules likes those made by B&O or Pascal. For the past three years, EJ Sarmento has been quietly designing his own Class D module which he says will not be available for licensing. 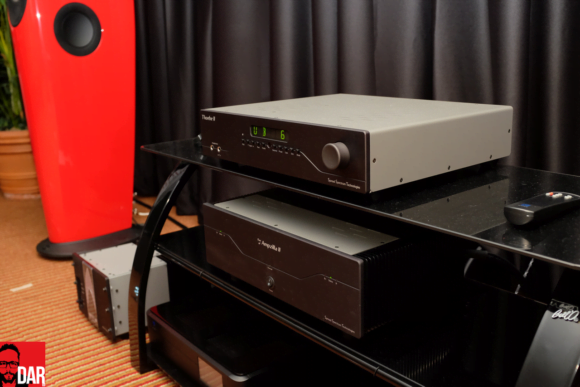 In the Statement power amplifier a pair make their debut. “The analogue waveform needs proper timing, just like a DAC. I use a PWM switching that runs at 400-500 kHz,” says the quietly-spoken Sarmento. The Statement pre-amplifier will be fully modular. Did someone hear Vinnie Rossi knocking? “I only heard about the LIO AFTERWARDS,” argues a somewhat bemused Sarmento. 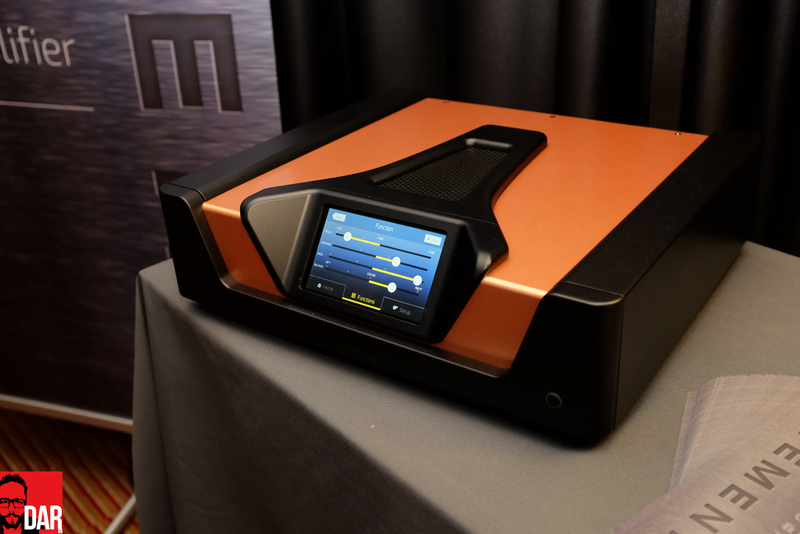 When the pre moves beyond its pre-production phase there’ll be user-installable boards for Airplay streaming, D/A conversion and phono pre-amplification as well as chassis colour options: red, yellow (on display at RMAF but looking more orange-bronze), green and blue. I spent a few moments convincing Sarmento that a Roon-capable streaming module would go down extremely well. Standing out like the proverbial nudist beach-bound porcupine is each unit’s angled touchscreen. On the power amplifier, the TFT screen will go full geek by showing volts, amps and wattage. Of more practical use will be its volume-attenuating touch rotary. Upping the eye candy factor will be virtual VU meters and spectrum analyser. 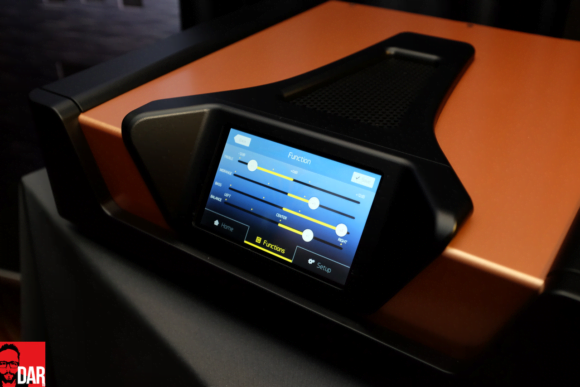 The pre-amplifier’s touchscreen will conduct input selection, DAC filter choice and/or phono cartridge loading. Both Statement units will also arrive with network connectivity baked in to their design so that new features and performance tweaks can be installed over-the-air via firmware updates. (‘Allo ‘allo Devialet). It also look like Sarmento is starting to take notice of calls for less esoteric-styled casework. Huzzah! 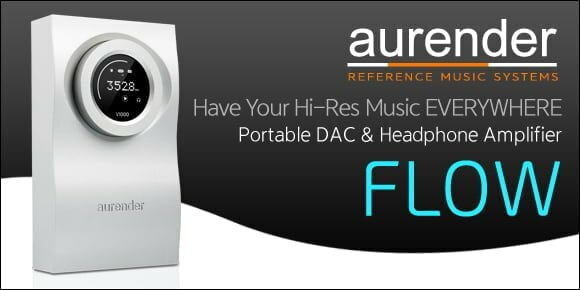 Pricing and production kick-off have yet to be decided but this is hifi with one foot already in the future. 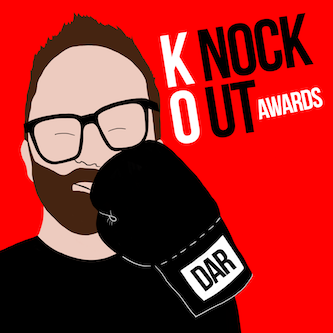 Like (the slightly older) Vinnie Rossi, EJ Sarmento isn’t just part of the next wave of audio engineers, he’s leading the pack. At RMAF he (again) showed us why. 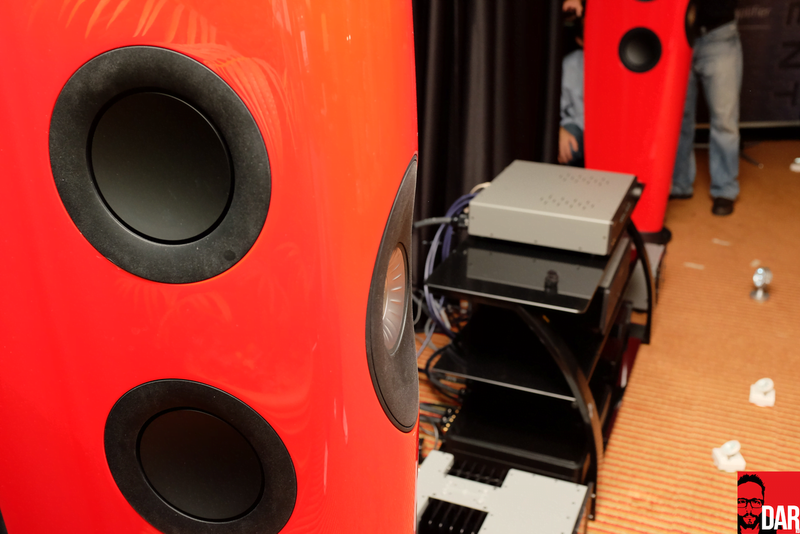 EJ Sarmento and Tony Holt of Wyred4Sound dial in the KEF Blade 2 at RMAF 2015. 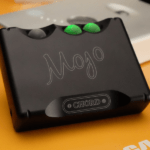 Previous article Chord Electronics Mojo: portable audio’s new talisman? UPDATED! I’ll buy this unite looks very cool . Interesting brand, but it’s absent in Ukraine. Nice colour of KEF Blade. I second the vote on EJ for prez! Very resourceful man and growing ever more so.